Otto Penzler’s Big Books series include some of the most substantial anthologies I’ve ever held in two hands. Big oversized volumes that clock in at nearly a thousand pages each, they’re virtually a graduate level course in American 20th Century genre fiction. His latest, The Big Book of Rogues and Villains, weighs in “at a svelte 928 pages… [and] is equally impossible to pick up and put down” (Kirkus Reviews). The best mysteries — whether detective, historical, police procedural, cozy, or comedy — have one thing in common: a memorable perpetrator. For every Sherlock Holmes or Sam Spade in noble pursuit, there’s a Count Dracula, a Lester Leith, or a Jimmy Valentine. These are the rogues and villains who haunt our imaginations — and who often have more in common with their heroic counterparts than we might expect. Now, for the first time ever, Otto Penzler gathers the iconic traitors, thieves, con men, sociopaths, and killers who have crept through the mystery canon over the past 150 years, captivating and horrifying readers in equal measure. The 72 handpicked stories in this collection introduce us to the most depraved of psyches, from iconic antiheroes like Maurice Leblanc’s Arsène Lupin and Sax Rohmer’s Dr. Fu Manchu to contemporary delinquents like Lawrence Block’s Ehrengraf and Donald Westlake’s Dortmunder, and include unforgettable tales by Robert Louis Stevenson, Bram Stoker, Washington Irving, Jack London, H.G. Wells, Sinclair Lewis, O. Henry, Edgar Wallace, Leslie Charteris, Erle Stanley Gardner, Edward D. Hoch, Max Allan Collins, Loren D. Estleman, and many more. I’m looking for a complete TOC, and will post it here when I find one. In the meantime, check out our previous coverage of Penzler’s massive anthologies. 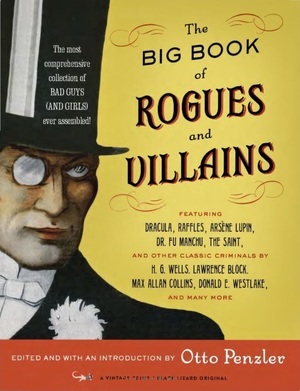 The Big Book of Rogues and Villains was published by Vintage Crime/Black Lizard on October 24, 2017. It is 928 pages, priced at $25 in trade paperback and $12.99 for the digital edition. I have this book. Around half through, and I can tell you, it’s chock full of good badness. Glad to hear it Bobby! Any favorites yet?